When you can’t get exactly what you need from a hydraulic systems manufacturer, it is time to go the custom route. When you ask Bernell Hydraulics to create custom hydraulic systems San Jose CA, you can get machinery precisely tailored to your unique fluid motion control needs. 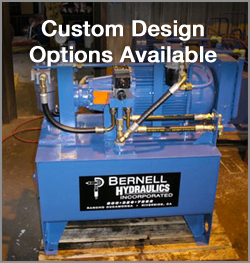 Bernell Hydraulics has the experience and expertise needed to handle your custom project from conception to completion. If you have your own design team, our highly skilled machinists can follow your schematics to create your custom hydraulic systems San Jose CA. If you just have an idea of what you want but no actual plans, our engineering and design team can sit down with you and create detailed plans that take all your requirements into account. Whenever possible, we try to incorporate name-brand parts from companies like Parker into your custom hydraulic system, as this will make future maintenance and repairs easier. We can service all kinds of custom hydraulic systems San Jose CA, even if we didn’t manufacture them. Whether you need fluids tested and replaced, hoses and seals checked for damage, or bent rods and warped cylinders replaced, we can help. We can even machine custom replacement parts for you if that would provide better performance than using an off the shelf part. Our technicians are also happy to lend an expert eye to your machinery to see if any improvements or upgrades could be made.